April showers will bring a month-filled with Shakespeare and song to Old Hollywood films. 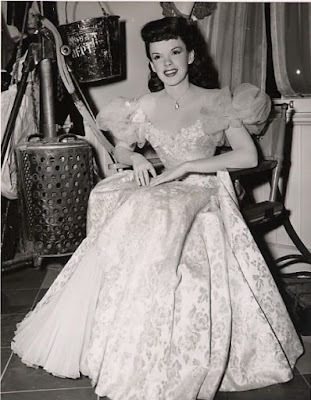 * TCM's star of the month is Judy Garland. I'll have a guide to the month's films on April 1. Plus I'll write four articles about Garland's best known songs each Friday, beginning on April 8 with "Somewhere Over the Rainbow" from The Wizard of Oz (1939). * I'll continue the 1001 classic movies series with four Shakespearean-inspired films. Go here for the full list and a little background. I've got quite a few good blogathons coming up in April. * First up is my review of The Letter for The Bette Davis Blogathon on April 5. * I'll look at The Heiress (1949) on April 9 for Beyond the Cover: The Books to Film Blogathon, which is all about movies adapted from books (The Heiress is based on Henry James 1880 novella, Washington Square). * I'll have an essay about the character of Holly Martins (played by Joseph Cotten) in the classic Cold War thriller, The Third Man (1949) for the Classic Movie Blog Association's spring blogathon. It runs from April 11 through April 15. * I'll review The Bridges of Toko-Ri (1954) on April 16 for The Golden Boy Blogathon: A William Holden Celebration . * Finally, I'll take a look at the life and times of legendary movie stars Elizabeth Taylor and Richard Burton on April 23 for The Star-Studded Couple Blogathon. * I'll also have the weekly TCM guide every Sunday, and, if time permits, a look at what's new on Netflix, DVD, and Blu-ray, and a celebration of Gregory Peck's centennial (the iconic leading man was born April 5, 1916).